Weight: 9.6 Oz Per Sq Yd. 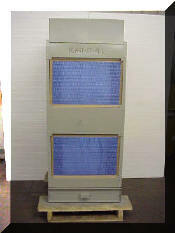 This type collector connects to the outlet side of the reclaim fan by a flexible duct. The inlet of the collector has a damper for balancing the air flow from the reclaim. 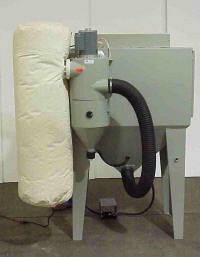 Blasting by-products are collected in a series of vertically attached cotton sateen dust bags. Dust is shaken from the bags by a manual mounted hand shaker. Dust removed by the shaking process is deposited in a dust drawer at the bottom of the collector.